I am in the process of picking all the exterior colors for the renovation of the stunning 1860-square-foot Spanish style home built in 1930 in the heart of View Park, LA. I have never had to make so many decisions in such a short amount of time other than right now. We started actual construction the first ever COCOCOZY Design House in the middle of April — and since then, I have been running around like crazy!!! Arghhhhh. One of the decisions that was easiest for me was picking Benjamin Moore as the exclusive paint partner for the project. The Benjamin Moore team was nice enough to give me all of the paint for both interior and exterior of the home. I felt honored that this brand was open to the idea of working with me and my team on this inaugural COCOCOZY Design House. Anyhooo… first step of the paint process is picking the exterior paint. I bring up Steve because he has always been the person I look to for home remodels and because his own home is the inspiration for the colors of the design house. 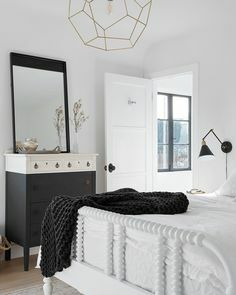 The vision: slightly off white with black trim and maybe just maybe a colorful door in a blue and or green shade. I was in Claremont, the town where I spent my preteen and teen years, and I ran across a darker colored Spanish style/Mediterranean inspired home and I nixed that as option. This is the color I decided to steer away from…saw this house while I was on a walk in my hometown…while the style of the house is on point with the COCOCOZY Design House, the color is too dark and too yellow. This is more of what I’m looking for! The inspiration house is painted Swiss Coffee. The existing house was off white with brown trim. I already loved the color and think it will be even better with a darker trim for contrast. In my last post about the COCOCOZY Design House, I revealed what kind of tile we will be using on the front walk and back balcony. I think the patterned tile will go nicely with the paint and the trim I ended up choosing (keep reading!). I can’t emphasize this enough — picking the right off white for the outside of the house was a challenge. I had Tiara and Dale from my team help gather a million Benjamin Moore whites to sample and a few dark colors for the trim. My typical process for picking paint is that I use painters tape to make big squares of each color. I then spend about an hour wondering and deliberating back and forth if I even have the right color samples, then I put on a second coat, and deliberate some more. After letting the paint dry for a few days, I come back and check to see which I like the best. I narrowed it down to three contenders and I put those on the front of the house: Swiss Coffee, White Dove, and Foggy Morning. Ultimately, I picked White Dove and then later that week I was reassured by Steve when he made the same choice on our early morning job site walk through. Phew, confirmation that I picked something right!!! White Dove is a soft white that has a little bit of yellow undertones and is neutral enough that it will look great! Anyhooo…I wanted a softer black for the trim so I picked BlackTop…which is black with green undertones to me…although Steve said he saw red undertones! My next big dilemma is the door color. I am leaning towards a softer black than BlackTop in a matte finish. I tried out some blues and greens just for fun, but I do not want the front of the house to be too busy with color and the patterned cement tile I picked… so I am leaning towards a black front door. Please weigh in. How do you feel about a colored door? Testing out various shades of blue and green! The top three off white shades (bottom left is my pick!) paired with options for a colorful door on the front of the house. Going through all of my Benjamin Moore samples! Now we have primed the house… in a few weeks, we will paint and then time for the big reveal! Thank you again to Benjamin Moore for the fantastic paint choices! So excited to see these colors in action very soon. Can’t wait for it all to be finished! PS – There is SO much going on at the COCOCOZY Design House! Follow along behind the scenes on Instagram @cococozy! Although a stately black front door is always beautiful…Please pick the Smokey blue (the sample on the bottom right of the door). The detail of the beautiful hand forged iron accents in the door will contrast nicely. The color will complement the terra cotta roof tiles. It is also historically appropriate. Great suggestion. I am worried that the colorful door will contrast too much with my cement tile choice for the front walk. See this post to check out the tile I picked http://cococozy.com/cococozy-design-house-selecting-tiles-from-cement-tile-shop/. Let me know what you think after viewing! Thank you for your awesome design insight! I love Benjamin Moore Baby Seal Black for front door.